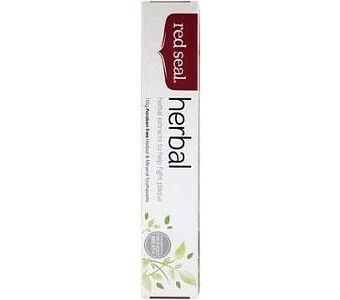 Red Seal Herbal Fresh Toothpaste comes in a fresh mint flavour to help freshen breath, and promote oral hygiene. Note: Non-fluoride. Natural colours. Contains 14 natural herbal extracts and oils. Anti-bacterial. Fights plaque and decay. Freshens breath. Must be used in conjunction with regular and proper brushing. Ingredients: Calcium carbonate; Water (deionised); Sorbitol; Glycerol; Sodium lauryl sulphate; Silicon dioxide; Sodium carboxymethyl cellulose; Magnesium aluminium silicate; Sodium saccharin; Chlorophyll; Light mineral oil; Hydroxybenzoates; Herbal extracts & essential oils (including Aniseed, Basil, Cinnamon, Clove, Eucalyptus, Lemon, Menthol, Nutmeg, Orange, Oreganum, Peppermint, Pimenta, Spearmint, and Thyme).